After weeks of filming swanky penthouses (some with er, slides) and extravagant Manhattan lofts made famous by the likes of Beyonce, we were excited to take an "Inside Look" at a much more unconventional home nestled in the Adirondack Mountains. And talk about unconventional! Beneath this home in Saranac, N.Y., lies a former Cold War-era nuclear missile silo and launch pad, built in the 1950s to house an Atlas-F intercontinental ballistic missile. Not your average, indeed! In fact, we learned that the surface home is simply the "secret entrance" to almost 15,000 square feet of underground space that's built to withstand tornadoes, hailstorms, hurricanes and the odd Soviet pre-emptive nuclear strike. No wonder some say it's one of the world's safest homes! Definitely one of the stranger houses we've been in, but still cool beyond belief. See for yourself. Brian Dominic, Michael DeRosa and Mike Franklin of Select Sotheby's International Realty have the listing. All parcels of land available for sale on the property appear as below (total $1.76 million). 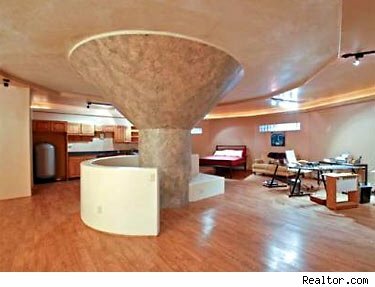 See more pictures of the converted nuclear missile silo home below. Get the Inside Look at other amazing homes on AOL Real Estate.